Hotspur: A Perfect Image of Honor? Where did the Queens Go? In Act V, Scene One of Henry IV Part I, as both the rebels and King Henry’s forces prepare for the oncoming the battle at Shrewsbury, Hal and Falstaff have a brief but meaningful conversation. Falstaff asks Hal to stand over him to protect him during the battle, and Hal responds, “nothing but a colossus can do thee that friendship” (V.i.1245). Hal, perhaps morphing into Henry V at this moment, concludes their conversation by saying, “Thou owest God a death” (V.i.1276). Henry exists, and Falstaff then offers a soliloquy on the concept of honor. In this soliloquoy, Falstaff emphasizes the absurdity of dying for something that amounts to a mere abstract concept, something that offers no tangible, material value. He proceeds by proposing copious rhetorical questions and answering them with literal counter intuition. He questions, “What is Honor?” and his response is, “A word” (V.i.1354). He asks, “What is in that word ‘honor’?” and answers, “Air” (V.i.136). He follows this pattern of self-questioning and literal answering, which leads him to conclude that since honor is only a prize for the dead, it has no real benefit and should not be sought after by the living. Shakespeare includes quotes around the word ““honor”” in this text, emphasizing, even in the written form, Falstaff’s detachment from the idea. Falstaff famously concludes his speech with the assertion, “Honor is a mere scutcheon,” an emblem image to designate death (V.i.141). Not surprisingly, Falstaff’s perspective on this subject is starkly different from many of the other characters in the Henriad. In Henry V, Falstaff’s old friend, Hal, states, “If it be a sin to covet honour, / I am the most offending soul alive” (IV.iii.310-321). Scholars have labeled Hotspur a “perfect mirror of honor” (Council, 42). Many of the narrative events throughout the plays hinge on characters gaining or losing honor, like the first duel in Richard II, or Hal’s heroic return to court from Eastcheap. 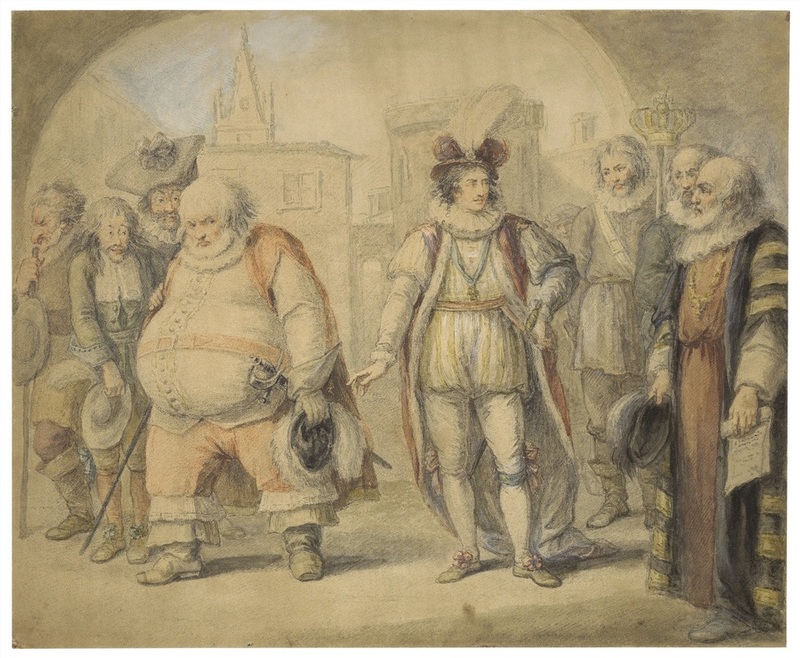 Honor carries serious weight in these plays, but Falstaff does not buy into it. The predominant belief among nobility that “dishonor is more to be feared than death, and honor more desired than life,” articulated by F. Markham in The Booke of Honor, simply does not register with Falstaff (1). Does Falstaff’s soliloquy about honor reflect a pragmatic life philosophy, or is it simply an excuse for his cowardly behavior? There are good reasons to argue for either side here. Falstaff certainly acts cowardly. He fakes death during thethis battle at Shrewsbury, a significantly dishonorable act. Barbara Donagan notes that desertion in early modern England “merited severe punishment” and public humiliation (271). Yet this cowardly act allows Falstaff to witness Hal defeating Hotspur in battle, and then take the credit for the killing. Falstaff gains noble standing; he gains troops under his command. And In Henry IV Part II, when Falstaff runs into some an enemy soldier, we learn that he has also gained a reputation for bravery and prowess in battle, and the soldier immediately surrenders to him. Before the battle, Falstaff asserts honor is merely a word filled with air, and so, following his stated philosophy, he hides from the fight, which ironically ends up gaining him serious honor and outward repute.